Come chill with us and Jonathan Brathwaite, COO of Singani 63! We'll have cocktails featuring our Stonecutter Spirits Single Barrel Gin and Heritage Cask Whiskey along with the Bolivian National Spirit Singani 63 Be sure not to miss our special mash up of both our spirits celebrated together in one extraordinary cocktail creation. Jonathan has curated a jammin' playlist to accompany these exclusive, and delicious, cocktails. Come down and try them for yourself! 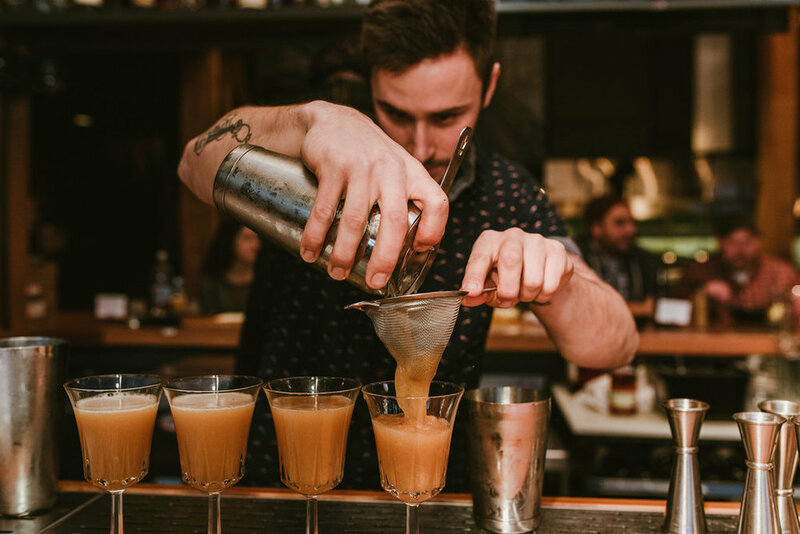 Come celebrate all things maple with us at Highball Social! We received so many amazing cocktail recipes in our Maple Madness Cocktail Competition with Runamok Maple and now it’s time to celebrate the winners! 1st Place Winners judged by the Stonecutter Bar Team on creavitity, taste, and if the cocktail enhances the experience of the featured spirit. There are two 1st Place Winners; one home bartender AND one professional bartender. They both receive 1st Place Prize: $250 cash + glory, $100 bar tab and a Runamok Maple gift basket. People’s Choice Winner is the cocktail recipe that received the most online votes. They receive People Choice Prize: Glory, $100 bar tab and a Runamok Maple gift basket. Check out all our wonderful cocktail submissions here! Join us at Farmhouse Tap & Grill along with our friends from Windfall Orchards. Enjoy tastes of our spirits (including our limited edition and hard to find Maple Cask Whiskey) as well as Windfall Orchard’s wild fermented ciders (and their Perry). There will be special cocktails as well as draft and bottle offerings. Join Stonecutter Spirits and the team from Highball Social as we taste our way through an introductory Amaro sampling, highlighting some of the Amari currently featured at Highball Social! Amaro (Italian for “bitter”) is an Italian class of liqueurs typically consumed as an after-dinner digestif. The Amaro category has also recently surged in popularity in the US, both as a neat sipping experience on its own as well as a dynamic ingredient in cocktails. This class will cover a brief history of Amaro with a guided taste through an introductory flight of various Amari along with a food pairing component. The selected Amari will range from bitter to sweet in order to show participants the great range of flavor profiles offered by the Amaro category. Then, afterwards, anyone who wants to continue the fun can order a full Amaro pour or their favorite cocktail at Highball Social! Tickets can be purchased through the City Market website. Join us for a night of magic inspired by two of our favorite things: Maple & Booze! You don't want to miss this maple inspired 4-course culinary adventure! Each course will be paired with a maple cocktail highlighting our Single Barrel Gin & Heritage Cask Whiskey and maybe something a little special (shhhhh, our lips are sealed). Kurt Kling from Schoolhouse Maple will be on hand to walk you through a guided maple syrup tasting and give an overview on sugaring in Vermont. Dinner is $69/pp + tax & gratuity. Call (802) 453-2432 for reservations. Fake it until Spring makes it here with our floral centerpiece class by Erin Ostreicher of Nectar & Root! Enjoy a complimentary cocktail (or mocktail) while you learn how to design a gorgeous centerpiece celebrating the lush blooms of spring, a bit early this year. Walk away with flowers perfect for your dinner table or bedroom nightstand, and stave off your Spring longing one more month! Some fine beverage producers of Addison County will be up for an evening at Misery! Come on by for a special snack and pintxos menu to pair with some of Windfall Orchard Ice Cider's great ciders, and a menu of cocktails featuring Stonecutter Spirits Gin and Heritage Cask Whiskey. Say hello to these great producers, and have something to eat and drink! No tickets, simply come on in from 4:00 on for the special menu. To celebrate sugar season and the release of our collaborative Maple Cask Whiskey, Stonecutter is throwing a cocktail competition with our friends at Runamok Maple! Whether you are a bartender by trade or a real whiz behind your home bar, try your hand at crafting the best maple cocktail the Green Mountain State has ever seen! We love us some oranges, lemons and limes at Highball Social, and we are thrilled to host a dynamic citrus arrangement class with by Erin Ostreicher of Nectar & Root! Enjoy a complimentary cocktail (or mocktail) while you learn how to arrange the perfect bouquet. Walk away with a refreshing bouquet filled with kumquats, fragrant blooms and textural foliage to enjoy your citrus in and out of your cocktails! Hunker down at Highball Social for a special screening of Star Wars Return of the Jedi; The Rebel Alliance lead by Skywalker, set out to triumph over the Galactic Empire with help from Han Solo, Princess Leia, and their other allies. We have two screenings going at 1pm and 6pm with complimentary hot chocolate courtesy of Lake Champlain Chocolates, with a more adult "spiked" version available for those looking for a Sunday Funday. All ages welcome! RSVP to let your friends know you're coming! Shake the winter doldrums with a floral class by Erin Ostreicher of Nectar &Root! Build your own cocktail (or mocktail) from our Choose Your Own Adventure menu and sip away while you learn how to create the perfect center piece arrangement. Walk away with a tabletop arrangement focused on planted, blooming bulbs to bring long-lasting life to your January living room! Hunker down at Highball Social for a special screening of Indiana Jones and the Last Crusade; Following Indy as he sets out to rescue his lost father and find the Holy Grail. Hunker down at Highball Social for a special screening of The Fugitive; Following Richard Kimble on the run from the law after he was wrongfully accused of murdering his wife. Our Sunday Movie screenings continue through January! To go with your free cup of hot chocolate, we'll be showing a series of Harrison Ford movies! To kick things off, we'll be following Linus, a workaholic businessman, as he falls in love with Sabrina after she returns from working in Paris in the movie Sabrina. We’re bringing in the new year at Highball Social in style—put on your favorite thing that sparkles and come down and party with us! Hunker down at Highball Social for a special screening of A Nightmare Before Christmas with a cup of free hot chocolate! This week we follow Jack Skellington, King of Halloweentown, as he discovers the meaning of Christmas! Movie starts at 1pm with complimentary hot chocolate courtesy of Lake Champlain Chocolates, with a more adult "spiked" version available for those looking for a Sunday Funday. Hunker down at Highball Social for a special screening of the Christmas Carol with a cup of free hot chocolate! To close out the series, we have the classic 1984 version of A Christmas Carol. Hunker down at Highball Social for a special screening of the Christmas Carol with a cup of free hot chocolate! This week we follow Mr. Magoo as a man who doesn't believe in Christmas in the animated version of Mr. Magoo's Christmas Carol. Bring your homemade gingerbread house to Highball Social and let local architects and builders judge your handiwork! Compete to win one of three prize packages while sipping special holiday cocktails. Hunker down at Highball Social for a special screening of the Christmas Carol with a cup of free hot chocolate! This week we have a modern take of the Dickens classic following a successful TV executive who has coldly driven away the love of his life in Scrooged. Hunker down at Highball Social for a special screening of the Christmas Carol with a cup of free hot chocolate! This week we follow Kermit and the gang in that classic holiday film The Muppet Christmas Carol. "Harry, I’m going to let you in on a little secret. Every day, once a day, give yourself a present. Don’t plan it, don’t wait for it, just let it happen"
GIVE YOURSELF A PRESENT | ONE NIGHT ONLY!!! Join us for a Pacific Northwestern inspired cocktail dinner paired with cocktails from our limited Twin Peaks cocktail menu. Come enjoy a four-course meal prepared for you by our guest chef, Frank Pace from The Great Northern. Welcome to our Mixtape Maker series at Highball Social! These evening highlight innovators in bar and booze–and gives you a chance to pull up a seat next to them in person while enjoying a playlist curated by our guest of honor! 2ND ANNUAL STONECUTTER SPIRITS COCKTAIL SCAVENGER HUNT! Kicking off Labor Day weekend, the Second Annual Stonecutter Scavenger Hunt is the biggest cocktail event in the state! Participants grab a Stonecutter cocktail at any of the 30+ participating Burlington and Winooski bars and get their scavenger hunt card signed by their bartender. Guests who find 5 or more cocktails between September 2-9 can return their card to Stonecutter Spirits for free prizes and a chance to win two tickets to Adventure Dinner, a speakeasy style dinner series presented by the local distillery. The sunshine is stretching into the evening and the garden is overflowing with flowers and bounty like no other time of the year--it's the perfect time to feast at the farm! Join the Adventure Dinner team for an amble with goats little and big by your side! Map in hand, you'll hike through a shaded thicket where cocktails and goats await on the other side. This trek is followed by a lavish feast at our 80 foot table filled to the brim with the garden green salads, local meats and fish.